Another weekend gone, another area of London explored. I spent part of this weekend in East London, in Haggerston and Shoreditch mainly. 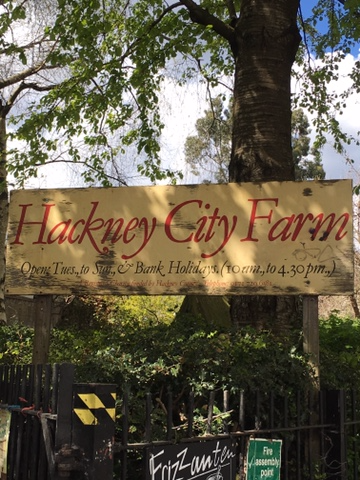 My boyfriend and I had long been wanting to go to Hackney City Farm for a day date so we decided to finally go. We got on the District line to Whitechapel station, before switching onto the Overground to Haggerston station. From there, it was about a 10-15 minute walk to the farm. Luckily for us, the weather was absolutely lovely, and not too cold either! The farm is just off the main road, and free to enter. We were able to see a variety of the animals - they have chickens, geese, ducks, donkeys, sheep (and newborn lambs) and pigs, and they actually offer produce from the animals to buy - no meat though! The farm is run mainly with the help from volunteers who work so hard to look after the animals and keep the place going, and they also have a beautiful garden full of plants and home-grown fruit and vegetables. It's such a lovely way to spend a day in London, but without being in the middle of all the hustle and bustle; having said that, you can see the skyscrapers in the distance, so you're not that far from The City, but it doesn't feel like you're in the capital! Perfect for a getaway day without the price or effort of a getaway. A short distance away is Columbia Road - home to the famous flower market. Unfortunately, we ended up there on a Saturday, and the market is only open on Sundays! However, the road itself is lovely with multicoloured houses and pop-up shops everywhere. We were saying it's a great place to come to if you want a souvenir that's a bit different and more individual! I found a secondhand bookshop too that had some really recent titles in, and managed to get 3 books for £10; I got 'How to be a Woman' by Caitlin Moran (wanted to read this for ages) and 'The Brightest Star in the Sky' by Marian Keyes for myself, and another book by Adele Parks for my mum as a little present. The staff were really nice and they had so much to choose from! We then wandered down to Shoreditch to visit Boxpark. It's basically an area full of pop-up shops and eateries that change every so often; but it's really cool and with lots on offer, you're bound to find something you like. It was absolutely packed on a sunny Saturday afternoon understandably, but we found a great little pizzeria to grab a slice for a few quid each. I've been to Boxpark before and really liked the feel of the place; when I have a bit more cash, I might do a little shopping trip here. All in all, a very successful day in E1 and E2!